Konami didn't want to change voices for the Silent Hill 2 HD remake, says the new actor. Besides his roles in Catherine, Final Fantasy XIII, and BioShock Infinite, it emerged a few recently that voice actor Troy Baker would be providing the voice of James Sunderland in the HD remake of Silent Hill 2. Fans reacted badly to the news, but Baker says that Konami had to change voice actors, because the original performer wouldn't come back. Baker said that Guy Cihi, who provided the voice and motion capture for James in the original version of the game, wanted Konami to pay him residuals for his performance, or he wouldn't reprise his role for the remake. Baker said that while residuals were common in other entertainment industries, they simply didn't exist for videogames. "He wanted non-existent money that he felt that he was owed," he explained. "And [Konami] wanted to use him again. Guy was the one who was outspoken about it and said that unless this happens he wouldn't do it, so he forced Konami's hands." "So if anybody wants to blame anybody for why they chose new voices, they can go back to the original James and he's the one to blame," he added. Baker said that the process of recording the lines was closer to his experience working on anime, than other videogame projects, because Konami had not redone the lip animation for the dialogue, which meant that the new cast had to follow the existing performance rather closely. He said that they had strived to stay true to the spirit of Silent Hill, even if they had occasionally strayed from how a line was originally delivered. However, he was well aware that no matter how good his performance was, some people weren't going to like it. He said that no one had forced him to take the role, and he understood people's reaction to people making changes to treasured classics, whatever the medium. He even said that he actually liked seeing some of the more kneejerk reactions, where people called him a bad actor without knowing who he was, and probably having enjoyed his performances in the past. "It's cool to see how people respond like that," he said. "It's kind of like a blind taste test." 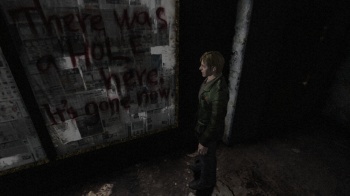 The Silent Hill HD Collection is scheduled for release on PS3 - and maybe Xbox 360 - in the fall.